Sightly rustic with a subtle nutty flavor, this foolproof fig & walnut no-knead bread contains whole wheat flour. 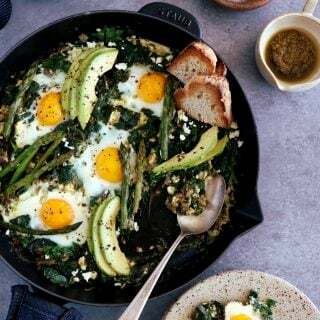 Serve with goat cheese and enjoy! This is Day #4 of our bread week, which means we have already passed half of the total recipes I will be sharing with you during these 5 bread-marathon days. 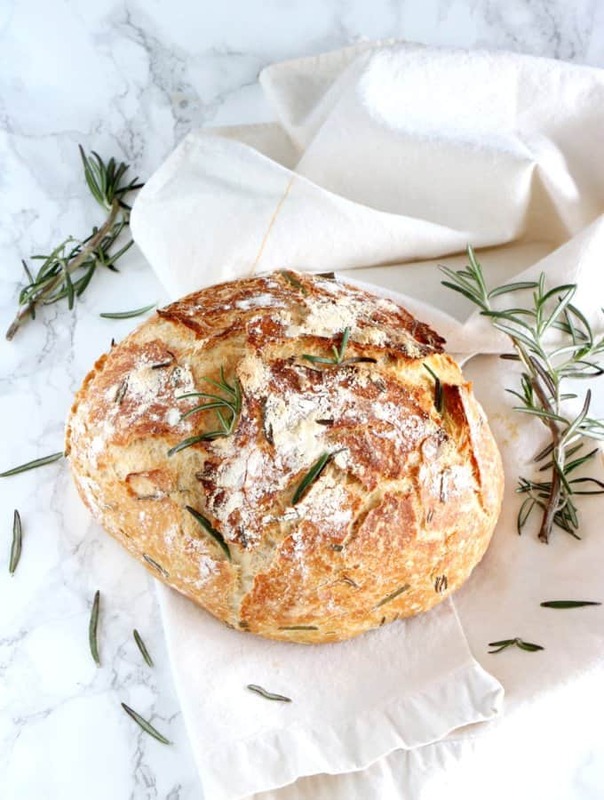 So far you’ve seen the world-famous easy classic no-knead bread, the multiseed no-knead bread and the rosemary and green olives no-knead bread, all recipes based on the classic one, to which I added a little twist. And I’m back today with another version, featuring figs and walnuts, a bread that is perfect with cheese, especially goat cheese. My personal recipe tip: slice the bread, add some soft goat cheese, a drizzle of honey and a few herbes de provence, then place in the oven on grill position for about 5 minutes. Once your tartine is baked, top with serrano and you’ve got it all. So simple, hence soooooo good! I’m French and this recipe is a classic of mine; I’ve been making it for many, many years and I’m never tired of it. Coming back to the bread recipe, I’m using here again the fantastic no-knead version. If you have been following me over the last few days, you already know what I’m talking about. If not, let me briefly explain what it is exactly. A no-knead bread is simple a bread recipe that skips the kneading part, this one being replaced by a very long fermentation (rising part). Basically all you need to do is mix the ingredients together (flour, yeast, salt, water), get a good night of sleep and come back in the morning to bake it. Yes, it’s that easy! I call it magic bread, or miracle bread, as it always turns out perfect with no effort. Based on the classic no-knead bread recipe, this version is almost the exact same one. 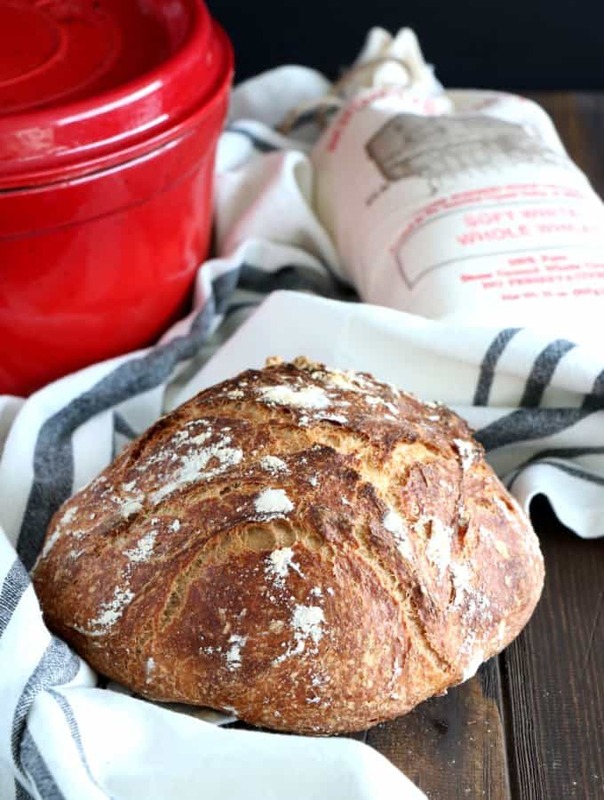 I just played a little bit with the recipe, combining both all-purpose flour and whole wheat flour, the last one bringing strong nutty flavors to the bread and a true rustic touch. I also added walnuts and dried figs to make the bread a little bit more special. 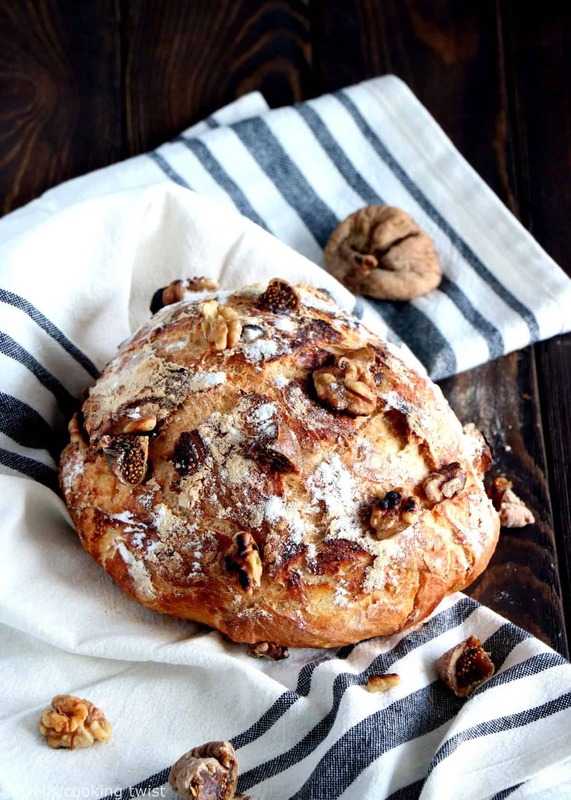 Figs and walnuts go hand in hand together and you will love them in the bread. As I mentioned it before, I am not the creator of the no-knead bread and I only want to spread the recipe around because I find it truly exceptional. 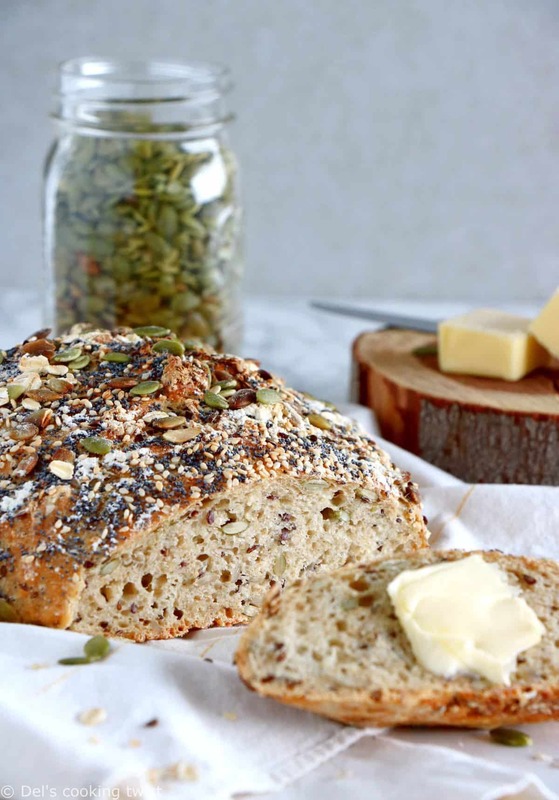 With sharing several different versions throughout this week I only aim to give you some inspiration to create new no-knead breads that will suit your mood of the day and/or your personal tastes. 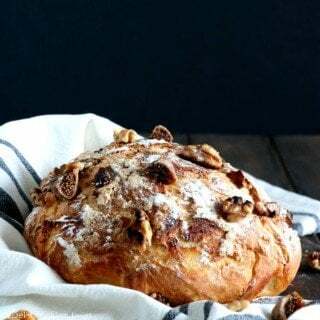 This fig & walnut no-knead bread is always a winner but could easily replaced by one of the suggestions above. I hope you enjoy! In a large mixing bowl, whisk the flours, salt, and yeast together until mixed. Stir in the water until a chunky, thick dough forms. If needed, add a few more teaspoons of water, just enough to get the dough barely wet throughout. If the mixture is too wet however, add a few tablespoons of all-purpose flour. Cover the mixing bowl with a cloth or plastic wrap and let it rest overnight (about 12 hours) at room temperature. While the oven is pre-heating, add the walnuts and dried figs to the bread. Gently reshape the bread to make sure ingredients are spread evenly. Once the oven is hot, remove the covered pot, and carefully line with parchment paper (be careful, it’s hot!). 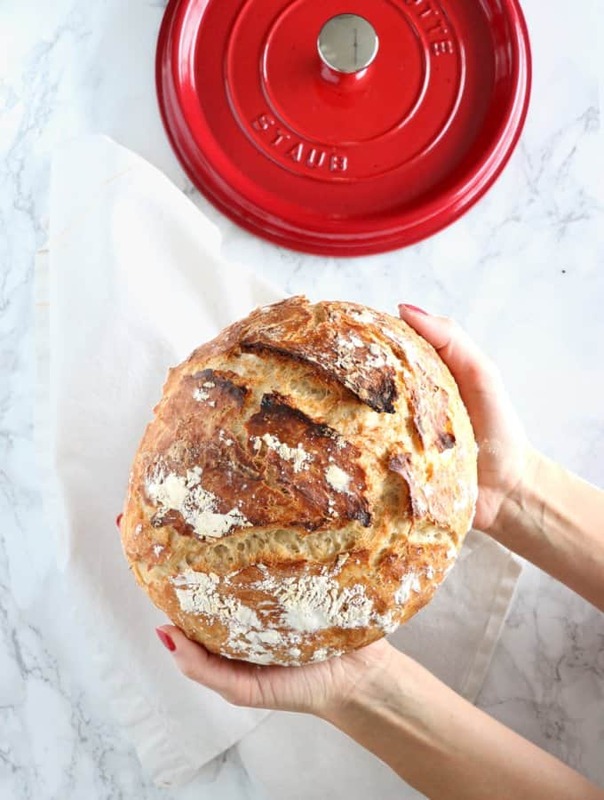 Gently scrape the dough from the bowl, shape onto a ball with your hands and place in the pot (the dough will look a little bit sticky and messy but it’s normal, just let it be). Gently sprinkle some flour on top, and place in the oven with the lid on for 30 minutes. Remove the lid, and bake for another 10-15 minutes to get the outside crust golden brown and crispy. Transfer onto a cooling rack, and let cool. It’s done! *If you really have no time, I sometimes skip this part and it works too. Just remember that it’s better if you follow this step but you don’t necessarily have to. NOTE: this bread doesn’t last long as it dries out quickly. It is best eaten fresh, ideally same day of baking or at the latest the day after. Rosemary & Green Olives No-Knead Bread. Ton pain cocotte est vraiment fabuleux !!! J’ai un peu de mal avec les figues quand elles sont sèches, malgré tout cela me fait envie, c’est une association top ! Thank you for sharing this recipe. 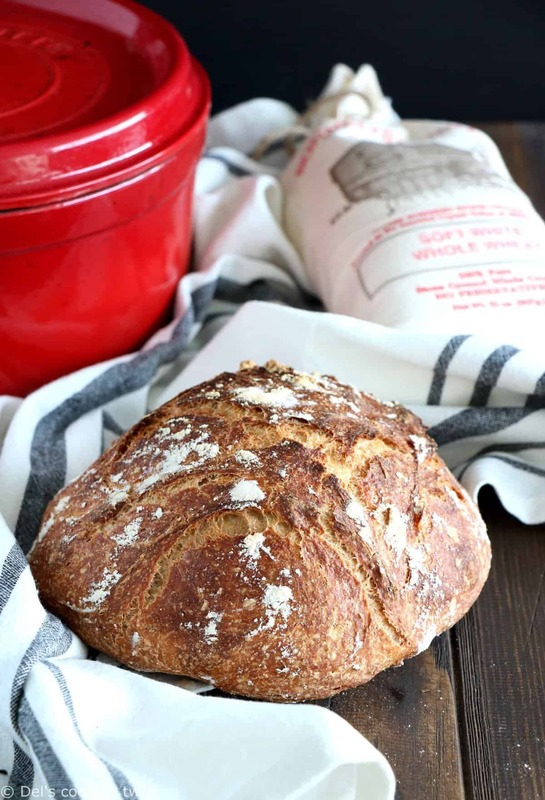 I tried the basic bread loaf and it was so easy and a huge hit with my family. It had a nice hint of sourdough, too. 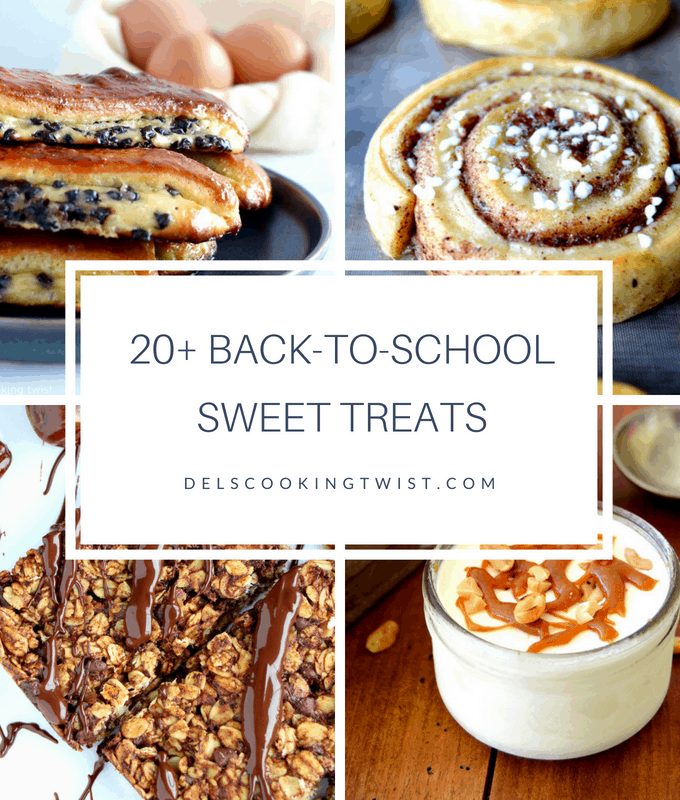 Have you ever tried one of the dried fruit & nut versions with cinnamon? Just wondering how much cinnamon you would recommend ( if at all).